Alarms are an integral part of every working man’s life. They might also just be the most disliked sounds by many, who hate to wake up from their beauty sleep. No matter how much we complain we still need them, that’s why now we have alarms in our Cell phones, which are now for many people their best friend. Just kidding. We have seen a lot of services moving online, so why not alarm clocks? Online Alarm Clocks are pretty useful and are also quite flexible. 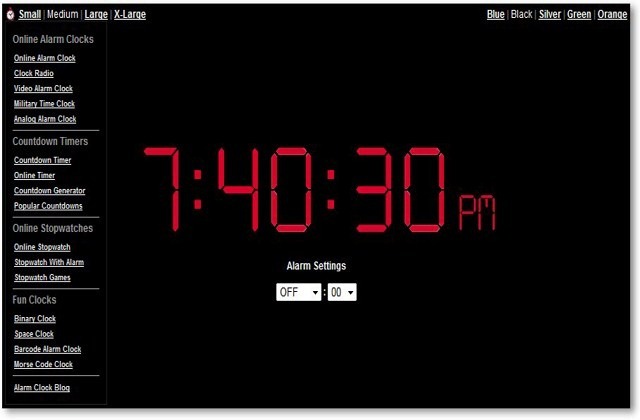 You can use the online alarm clocks, either as a primary or secondary wake up call. 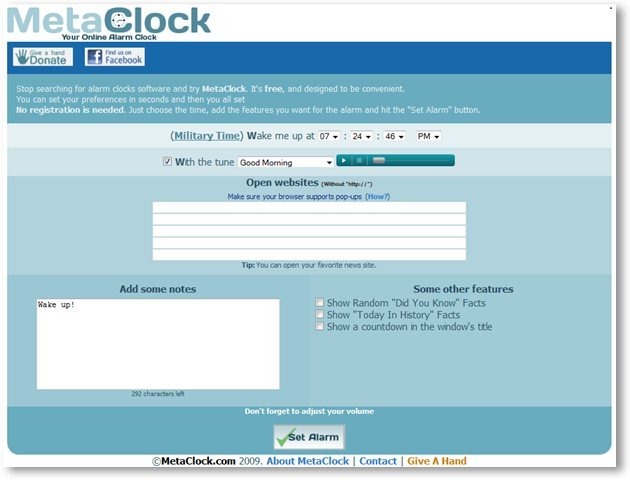 Although there are several Online Alarm Clock websites on the internet, here we have listed some of the best ones we liked. 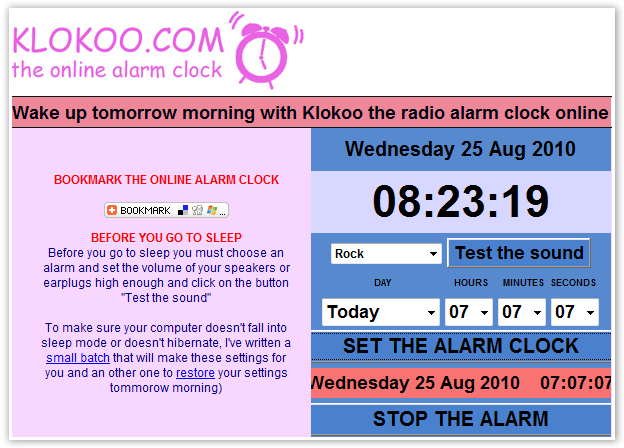 Many of these Online Alarm Clock websites have a number of features, whereas others simply function as a simple Alarm clock. Some allow you to use YouTube Videos to wake up whereas others have provided default alarm sounds. Read about them and choose the ones you like the best. The online alarm clock websites listed below are not arranged in a particular order. Select a suggested video or choose one with the YouTube browser. Update: New feature added, now comes with a Snooze button. You can also select one of the five available themes for the looks of your alarm clock. It also offers online notes and online timer facility. 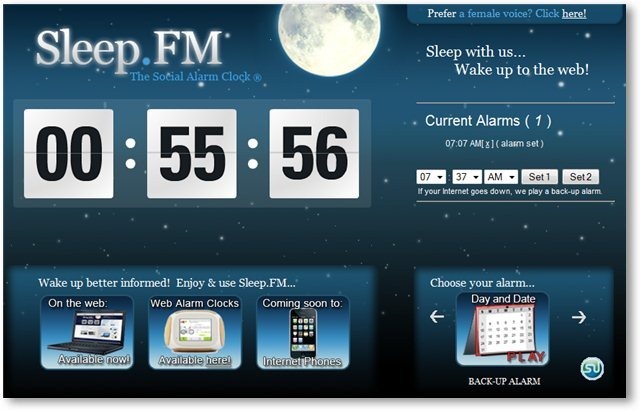 Sleep.fm allows you to set two alarms. If the internet goes down, a backup alarm is played. Bookmark alarm times to easily save & set the Sleep.FM alarm! Onlineclock.net is loaded with features and offers you a variety of clocks for all purposes. The size of the clock can vary from small to extra large. 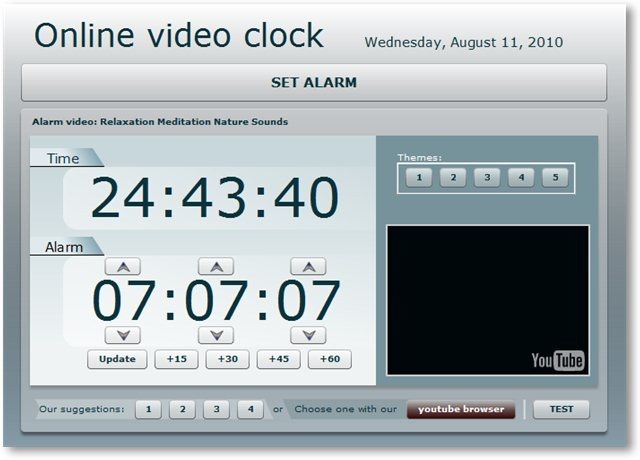 Besides the regular clock, you can also choose from video clock, military time clock or an analog clock. Also offers a countdown timer, stopwatch, and fun clocks like space clock, binary clock, and a Morse code clock. ALARmd lets you select the day and time for the alarm as well as the alarm tone. You may select one of the available tones or add a tone of your choice. It supports MP3 (must be hosted online), YouTube videos, and last.fm user or tag streams. You can also have a countdown to your alarm time. Option to set multiple alarms. Customize Time font size and colors (red, green, or blue). You can use the Test button to make sure your alarm is set as you want. 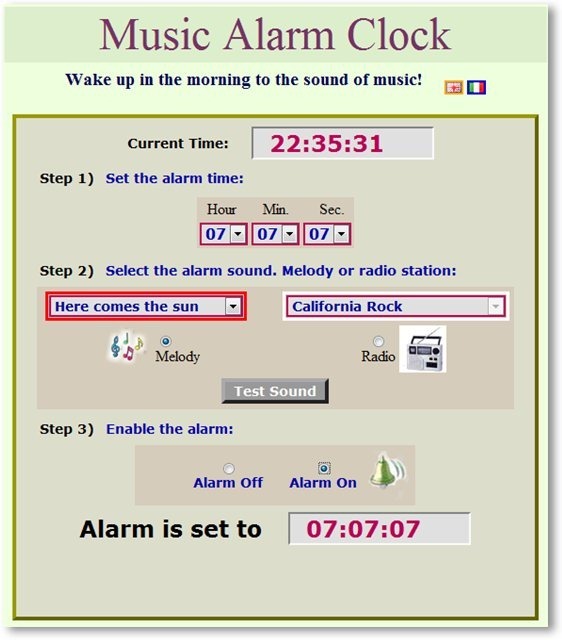 A simple to use music alarm clock. Set the alarm time, select your favorite melody or radio station from the list and turn on the alarm. You can test the sounds of the selected music or radio station. 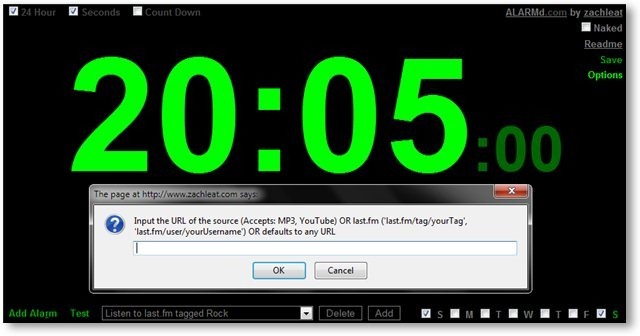 Alarm tube is a simple alarm clock that wakes you up with a YouTube video. Select a video from the features videos or search for one. 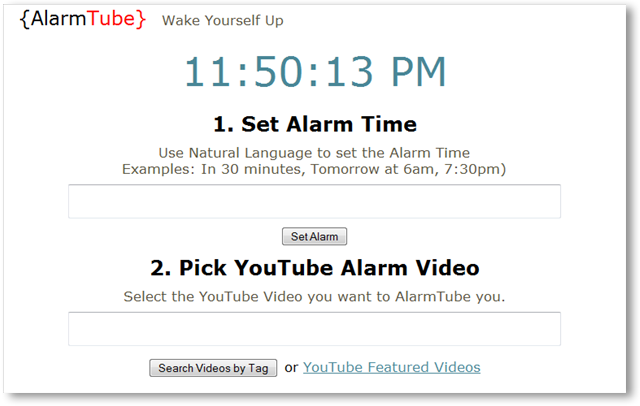 You can also set the alarm using natural language, for example, In 2 Hours. 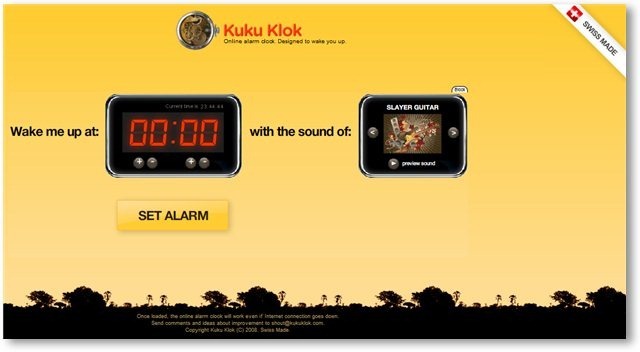 Kukuklok is a simple yet effective online alarm clock to wake you up on time. A simple to use an alarm clock with an analog interface. 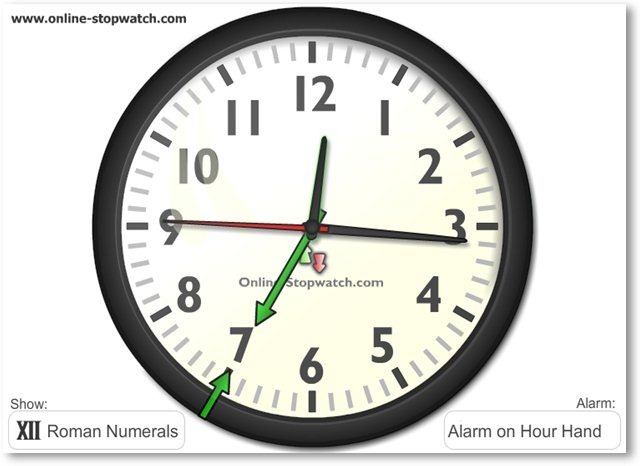 Turn the alarm clock and select the minute or hour hand to set the alarm on. Then drag the green arrow to the time you want the Alarm Clock to go off! Select Roman or numbered display on the clock. The clock begins to flash red as the alarm goes off. The shrill tones are sure to wake you up! Set the time for the alarm. Select one of the four tones available. Turn on the alarm. Add a note with the alarm (optional). 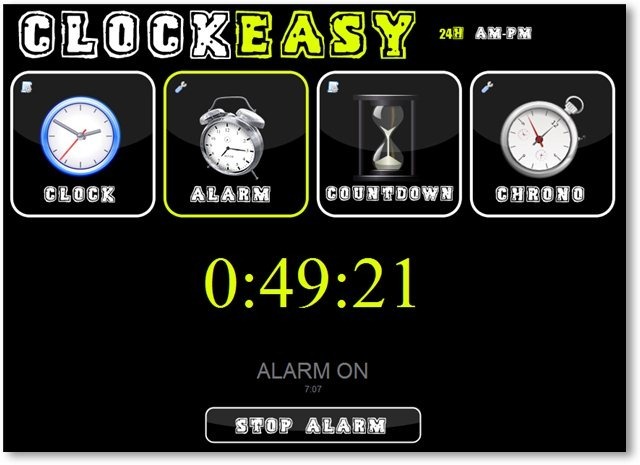 Clock easy is a useful utility that offers a clock, an alarm, a stopwatch and a chronometer in a single package. Setting up alarm is easy, just select the time for the Alarm and it will wake you up. The clock and the countdown timer can be easily embedded on your blog or personal web page as a widget. The widget’s looks, style, text font, colors, borders, and dimensions can be customized. Anvoy alarm clock is a simple alarm clock that simply does what it says. Set the alarm time, select one of the three tones and your alarm is set. It also offers the snooze option. Set the alarm time and click on the ‘Set Alarm’ button. Tick ‘Use Audible Alarm’ if you wish to play a tune. The message pops up in a new window and you have to close the window to turn off the alarm. *You need java enabled browsers to run this application. Metaclock is not only a great online alarm clock; it also sets you up for the reading session after you wake up. Set up your alarm time and select the tune. You can add notes along with your alarm. Click on ‘Set Alarm’ and your work is done! Eggtimer isn’t your typical alarm clock, but more of a reminder service. But you can also use it as an online alarm. The only thing missing in Eggtimer is the option to select a sound that can “really” wake you up. But since its designed more like a reminder service, it can give you a gentle nudge when you are supposed to remember something or remind you that the time allocated to a certain task is over. 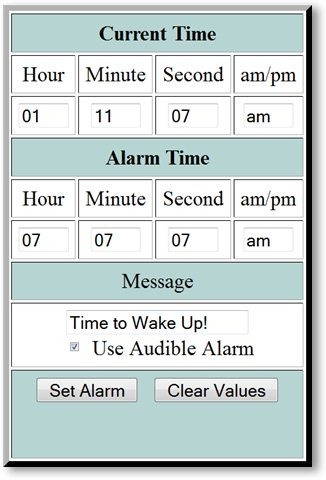 A simple and straightforward Online Alarm Clock. Select a sound from the given options, choose the alarm time and click on “Set The Alarm” button and you are good to go. So after going through the list which one did you like the best? Share your thoughts in the comments below.